There is growing interest about how climate information can be used to better inform decision-making across a range of sectors and socio-political and environmental settings. To investigate this across sub-Saharan Africa, the Department for International Development (DFID) through the Climate and Development Knowledge Network (CDKN) commissioned four pilot case studies in different countries to elicit the current and potential future use of weather and climate information in policy and planning. This report presents the findings from the Malawi case study that focused on national level policies, policy makers and decision-making processes. The study was led by Kulima Integrated Development Solutions and the University of Leeds. To ensure complementarity with ongoing country processes around mainstreaming climate–resilient development, this report focuses on three cross-cutting sectors of social protection, food security and disaster risk management. 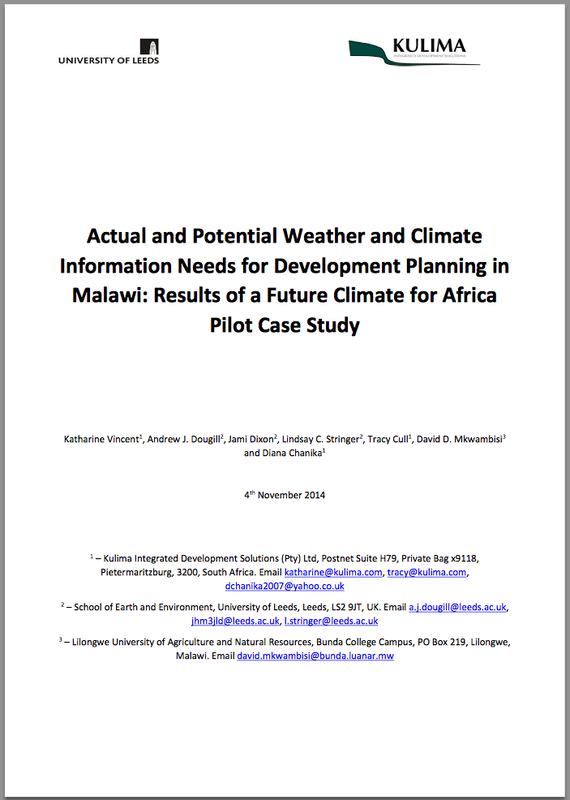 to assess how this pilot project’s findings support other ongoing initiatives in Malawi, namely the National Adaptation Plan (NAP) development, and the Global Framework for Climate Services (GFCS) project to improve the quality and quantity of climate services. The objectives were achieved through: an analysis of existing policies and institutional structures (Objective one); semi-structured interviews with both government and non-government stakeholders that explored the nature of decision-making processes and policy-making across a variety of sectors and the extent to which weather and climate information is currently utilised (Objective two); a national stakeholder workshop of government representatives from the different departments and ministries concerned with the cross-cutting themes, which was designed to identify the potential application of weather and climate information in Malawi’s national planning and decision-making (Objective three); and a discussion of how findings could link with other initiatives nationally (Objective four). The longest current timeframe for political decision-making in Malawi is over a 10-15 year time horizon and is led by the Department of Economic Planning and Development. Sectoral planning processes currently take place on a shorter timeframe of up to five years, and are mainly concerned with the implementation of the Malawi Growth and Development Strategy. There was no evidence of ministries using existing medium- or long-term climate projections in their current decision-making, despite the availability of country-specific profiles, regionally-downscaled climate scenarios and the CMIP-5 projections from the IPCC Fifth Assessment Report (IPCC, 2013). A number of perceived limitations of existing climate information were raised during the interviews and the workshop. These limitations include scale, accessibility, policy planning cycles and timing, which act to impede the use of climate and weather information in decision-making. Further consideration of such challenges and ways to address them is needed for more effective use of medium-long-term climate information. Potential opportunities for more effectively using climate information are also identified in the report. Findings suggest potential uses for information at the sub-annual scale as well as for short-term information (1-5 years). Information on extreme events – especially floods and droughts but also strong winds and hail – was regarded as being very useful, as was the location of these extremes. Many ministries asked for multi-year (up to five years in advance) forecasts for a variety of parameters (e.g. temperature; intensity, amount and distribution of rainfall; drought). Additionally, all of the departments and ministries recognised that the short-term information that they identified above was also useful on a medium-term (6-20 years) timescale – e.g. temperature and rainfall projections for 10 years from now. For example, the Ministry of Irrigation and Water Development acknowledged that knowing changes in these parameters would be essential in the design and location of future dams. Existing co-ordination structures for weather and climate information exist in Malawi, and certainly seem to function at national level between the Department of Climate Change and Meteorological Services (DCCMS) and other line ministries. However, several interviewees across a variety of ministries and departments noted the need for a better understanding about what climate change is and the risks it poses. Additionally, various departments reported limited capacity to understand weather and climate information. 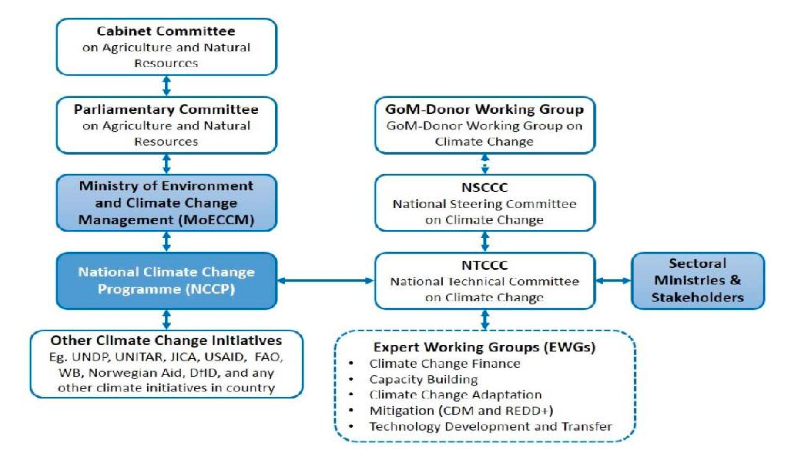 Additional capacity building and training on climate change, its potential impacts, and how to integrate short- to medium-term climate information into existing policies and decision-making processes may be needed. This demonstrates that effective use of climate information needs both improved science and better communication of the science. Findings presented in this report will inform FCFA (Future Climate For Africa) but also be of use to DFID Malawi in directing their programming, as well as to the Government of Malawi (GoM) in identifying opportunities for synergies and improved use of weather and climate information in their national policies and commitments under the United Nations Framework Convention on Climate Change (UNFCCC). Furthermore, there is further potential to link with other initiatives in Malawi and globally, for example the Global Framework for Climate Services (GFSC), a global partnership of governments and organisations that produce and use climate information and services. Katharine Vincent, Andrew J. Dougill, Jami Dixon, Lindsay C. Stringer, Tracy Cull, David D. Mkwambisi and Diana Chanika. Future Climate for Africa: How is climate information being factored into long-term decision-making in Africa? Bunda College of Agriculture is one of the five constituent Colleges of the University of Malawi.